Adorn your table in rufescent elegance with the Winter Bloom 16-Piece Dinnerware Set by Elama. 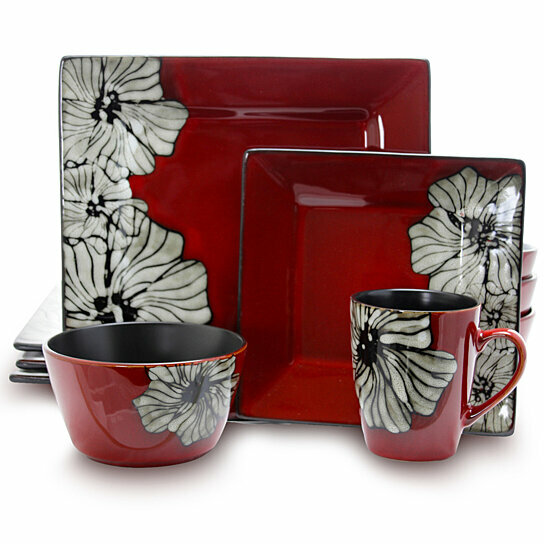 A delicate white hibiscus flower caresses the red hues of this set to bring warmth to your winter gatherings. The glossy finish nicely compliment the graceful square shape of the plates, adding flair and style to dinner times. The set is dishwasher safe for easy cleaning. The set is also microwave safe for a quick reheat.